Alice Marie Fristed, a longtime resident of Prior Lake, passed away Friday, November 30, 2018. A funeral service will be held Monday, December 10 at 11 AM with a visitation 2-hours prior, all at St. Paul’s Lutheran Church, 5634 Luther Rd. SE, Prior Lake. 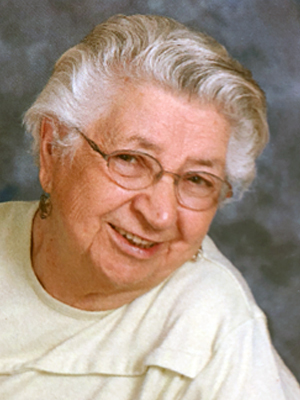 Alice will be laid to rest at Viola Lake Cemetery in Webster, WI. Pastor John P. Vaughn and Pastor Mark Neumann will preside. Pallbearers will be Bob Berg, Carlos Fristed, Travis Fristed, Jay Keppen, Harlan Nickerson and Myron Nickerson. In lieu of flowers, memorials are preferred and will be distributed by Alice’s family in her memory. On March 2, 1929, Alice was born to parents Lawrence and Edna Augustine in Webster Wisconsin. In her adulthood, Alice worked as an elementary school teacher. For thirty plus years, she educated the children of Prior Lake. She was proud to know her great-grandchildren, Delaina and Grant, attend the school where she taught. Alice’s life was enriched when she married Albert Fristed on December 30, 1950 in Spooner, Wisconsin. They were blessed with 60 years of marriage. In her free time, Alice enjoyed bird watching, playing scrabble, and being with her family. Summers were spent at the family cabin where she played cards with her children, went fishing, and enjoyed nature. Alice was an excellent baker. Her famous rhubarb pie was enjoyed by many—her family, fellow teachers, and her husband’s coworkers. She always safeguarded the recipe! A faithful woman, Alice was active in her church. She participated in bible study and the ladies quilting club. Along with her husband, Alice volunteered at the Prior Lake VFW and was a member of the Ladies Auxiliary. Alice was a compassionate, generous woman who cared deeply for her family, friends, and community. She is loved and missed by her sons, Glenn (Deb) Fristed, Don Fristed, and Ted Fristed; grandchildren, Travis (Mandy) Fristed, Sam Fristed, and Andrew Fristed; great-grandchildren, Delaina and Grant Fristed; sister-in-law, Anna Nickerson; nieces and nephews, other relatives and friends. There to greet Alice in Heaven is her husband, Albert Fristed; son, Allen Fristed and daughter, Joan Fristed; daughter-in-law, Karen Fristed; parents and sister. Alice’s family extends their deepest appreciation to those who cared for Alice—the staff of McKenna Crossing, Optage Hospice, and Jasmine Wilson who provided her with the gift of music. So sorry to hear of Alice’s death. I taught with her at WestWood for many fun years. She was always supportive and had a smile for everyone. I missed her when she retired. What a wonderful person. We send our condolence and our thought goes to the family..we are glad we met Alice and have some good memories from our visit. She was a lovely lady. Love from Joan and Kim DK. My thought and payers are with you all. I so enjoyed meeting Alice in August. It’s so hard to lose our parents no matter how old we are. I taught third grade with Alice at Westwood for four years. She was most helpful and patient as she helped me become included in the routines, culture and curricula of the grade level. She was a tireless child-centered educator who helped guide her students and their parents through their educational journey in the Prior Lake-Savage Area Schools. Alice’s rhubarb pies were always a treat. She talked with pride about Albert and her family. Her quiet steady manner was appreciated and missed when she slipped into retirement. Cry freely as you need, remember deeply during quiet times and share your reflections with others, laugh as you recall Alice’s life, love and gifts to you and others. As time begins to heal your broken hearts, you will live with her in your hearts and will she will always be there to comfort you. Blessings to your family and friends. Alice waits with her Lord for the second coming. I am SO SORRY. I just found out about Auntie. She was my favorite Aunt. She was a gem and I know she will be missed by everyone.